Ashes: What difference does an extra 5mph make for a fast bowler? Pace. Expect it to be back on the agenda during the third Ashes Test this week. The pink ball and floodlights gave Adelaide the movement of Edgbaston for periods of the second Test, and England took advantage. But the tourists can't always expect that sort of help during the remaining matches. This week in Perth, the difference in the speeds of the two attacks is again set to come to the fore. Why do Australia have faster bowlers than England? Are there flaws in the English system that prevent bowlers from reaching excess speeds? And why does it matter? 85.6mph or 89.1mph - what's the big deal? To mere mortals, the difference in the speeds we're discussing seems negligible. If Chris Woakes, England's fastest bowler, is averaging 85.6mph and Mitchell Starc, Australia's fastest, is at 89.1mph, what's the big deal? On top of that, there's an argument that you don't have to be bowling at the speed of light to be successful in Australia. Glenn McGrath, who has taken more Test wickets in Australia than any other seamer, did it by favouring accuracy over speed for the majority of his career. Just below McGrath on that list are Dennis Lillee, Craig McDermott, Brett Lee, Mitchell Johnson and Jeff Thomson. All, with the exception of McDermott, had pace to burn. As the graphic below shows, Australia have sent down many more deliveries in excess of 87mph during the current series. Those deliveries have yielded 21 wickets, in comparison to England's four. When the pitch is flat and the ball doesn't move, the extra four or five miles per hour can make all the difference - more likely to beat the batsman for pace, to magnify any flaws in the technique, or test his courage. This illustration below shows how quickly deliveries of different speeds reach the batsman, highlighting the time difference in playing a ball in excess of 90mph, or one down in the 70s or 60s. "The main difference is knowing there is a different length that bowlers of 90mph and above can bowl," said former England batsman Nick Compton. "In county cricket, or internationals you play in England, bowlers pitch it up. Yes, there might be the odd bouncer, but it's not that quick. It's not really going to rush you. "When someone starts reaching those paces in excess of 90mph, you think 'hang on a minute, there might be a couple of balls that are shorter and I've got to be ready for those'. Then, suddenly, they go fuller and your feet aren't moving. "There is also the fear aspect. If someone's really quick and hostile, whether you've practised it a million times or not, it's not nice. It's something you can work on, but until you know what it's like to face that sort of hostility, there's not much you can do to prepare for it." *The speed of the ball from the hand is the only measurement used, with other factors such as the environment not considered. Is pace born or made? If the impression is Australia are blessed with scores of rapid bowlers, prowling the outback ready to tear into English batting, that is not entirely accurate. In addition to Starc, Pat Cummins and Josh Hazlewood, Nathan Coulter-Nile and the injured James Pattinson are capable of bowling at high pace, but it is not as if every state side have two or three 90mph bowlers. "They're not falling off trees," said former Australia opening batsman Chris Rogers. "At the moment we're a little bit blessed to have three quicks in the Test side that are starting to peak at the right time." But sportsmen are a product of their environment. The skills that have brought James Anderson and Stuart Broad more than 900 Test wickets between them were mainly learned in the English conditions that help the ball to move. In Australia, a bowler may not have much choice but to bowl 90mph and above if they want to reach the very top. "The Australians are used to bouncy wickets," said England bowler Toby Roland-Jones. "They seam around a lot less, so pace through the air holds a high value." McGrath believes genuinely fast bowlers are born, rather than made. David Saker, the former England bowling coach who now works with Australia, suggested the climate and outdoor lifestyle down under might make it more likely for the Aussies to unearth speed merchants. There is also a belief that the extra yard of pace, the four or five miles per hour that make the difference, cannot be coached. "I don't feel that if I tried harder or ran in harder, I'd find a way past 85mph," said Roland-Jones. "I bowl at about 83mph. That can change day to day and I'm not quite at my limit. "You can find a way of eking out a couple of miles an hour from different bowlers, but finding that extra five miles an hour towards that 90mph mark, where it seems to make a difference, is really tricky." But there's disagreement. Both Steffan Jones, a former Derbyshire and Somerset bowler, and Ian Pont, formerly Bangladesh bowling coach, believe extra pace can be taught. "It's about having the correct understanding of the bowling action and getting the training right," said Jones, now a coach with a self-confessed obsession for pace. "I'm not saying that absolutely anyone could be taught to do it, but if someone has the raw materials to bowl at decent pace, an extra one or two yards could be added if you study their action and then do the correct work." Pont, who had spells with Nottinghamshire and Essex, added: "From a position of human movement - can we run faster, jump higher or throw further? The answer to all of the questions is yes, so why should fast bowling buck the trend of biomechanics? "Unless you have the most efficient bowling action on the planet, you can improve it. I cannot name you one bowler on this planet that has maxed out his speed." 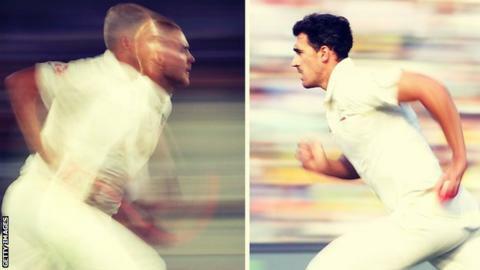 How fast are the fastest bowlers in the Ashes? **All deliveries are assumed to be on a good length, and average speed during the first two Tests has been used for each bowler. Do England put the brakes on pace? Even if England do not have bowlers capable of matching Starc or Cummins, bowlers of 90mph do exist in county cricket - they just aren't in the Ashes squad. Liam Plunkett was not selected, Mark Wood was not fit, Tymal Mills only plays T20 cricket and Jamie Overton was injured. Sussex's George Garton is young and raw, and, going back further, Stuart Meaker and Mark Footitt have skirted the squad without ever playing in the Test side. Perhaps the question is not why do England not have any express bowlers, but why are they not in the team? The finger is often pointed at the structure of county cricket. Greener pitches at the beginning and end of the season mean the 80mph bowler can wobble the ball around with success, while a workload of 14 first-class matches on top of one-day and T20 cricket (more matches than the Australian domestic season) is demanding on the body. "It's tough for guys to maintain that physical state throughout the season," said Roland-Jones, who has missed the Ashes tour with a stress fracture of the back. "Any bowler that is bowling across all three formats, it's certainly very tricky and can lead to an element of trying to manage your feelings, your physical state, and trying to make sure you can be effective over a long period of time." The England and Wales Cricket Board (ECB) has looked to change pitches in the County Championship by introducing new rules on the toss - visiting teams now have the option to bowl first if they wish. The theory is home sides have to produce flatter surfaces, meaning raw pace and spin are more valuable weapons. In the case of Somerset, their Taunton home has helped left-arm spinner Jack Leach become the leading wicket-taker in Division One over the past two seasons. "The new toss rules have helped," said Rogers, a former Somerset captain. "A pitch like Somerset's will also develop quick bowlers. You can't just be a medium-pace bowler because there's nothing there for you." All of this is an inexact science. How often have we heard an old pace bowler chuntering that the modern breed actually don't bowl enough, that too much time is spent in the gym, rather than getting fit to bowl by actually bowling? He may have a point, though. "A lot of guys get muscular, but muscles can make you strong yet slow," said Pont. "You don't have to be strong to bowl fast. Dale Steyn and Brett Lee, for example, are not muscular guys. "Strength and conditioning is a myth, even if it is done for the right reasons. I bet Ian Botham didn't see the inside of a gym during his career." Going deeper, Jones suggested competitive cricket at too young an age can discourage youngsters from bowling fast. Are parents, coaches, and maybe even the players themselves happy for slower bowling if it means accuracy, control and winning, rather than risking pace? "Instead of asking a young player if he has won, or what his figures are, I want to know how fast he has bowled," said Jones. Kevin Shine, the ECB's lead fast-bowling coach, is used to criticism of the English system, but says nothing will be used as an excuse. "We're not arrogant enough to think we know it all," he said. "We're constantly looking to improve using information on performance, injuries and workloads. "You must not lose sight of the fact that fast bowling is absolutely brutal and our guys do an awful lot of it." England's highly skilled fast-medium bowlers have been incredibly effective in their own conditions - only once since 2012 have England lost a home Test series. But there are two problems. Anderson, 35, and Broad, 31, are nearer the end of their careers than the beginning and, recently, England have not been able to win away from home. Their only away triumph since 2012 was in South Africa, where the movement of the ball can be similar to England. When the situation has demanded pace, or perhaps spin, England have floundered. England could hope Wood gets over his injury problems in order to significantly add to his 10 Test caps. Jamie Overton is highly thought of, but a back problem restricted him to only six first-class games in 2017. Garton was called into the England squad as cover at the beginning of the Ashes tour, but conceded 86 from 10 overs when he played for the Lions in November. "Jamie Overton - at full tilt, he's someone who not only bowls fast, but has skills to go with it. That always adds that extra edge to someone who can ramp it up the pace," said Roland-Jones. "There's a lot of talk around George Garton, who's certainly got slightly more of a slingy action. When it clicks for him, he can really get his speeds up there. "England have got a focus on producing them, and are managing to do so, but it's trying to find these guys game time and keeping them fit." Beyond names that have been mooted as England prospects, Shine has identified plenty more pace. "We have Tom Barber, a young left-armer from Middlesex. He's the fastest bowler we've ever tracked in our Lougborough testing. He'd come up at 94mph on the TV speed gun. "Zak Chappell from Leicestershire is 6ft 5in and Ollie Stone, coming back from an injury, is regularly clocked at 90mph. George Scrimshaw is another very tall bowler and Josh Tongue is with the Lions this winter. "They are out there. We're not struggling for high-pace bowlers, but it's not just about pace. "We want them to be consistent, robust and skilful." There you have it. The cupboard isn't bare. The challenge is to keep bowlers fit, to give them a domestic game that prepares them for international cricket and to have the luck that they eventually make it to the Test arena.